Today we are going to look at moles on the palm which help to indicate matters about health, mind, moods, and personality. 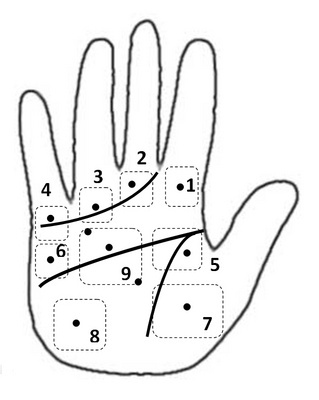 Moles on the palm are complementary indications that can supplement any readings from the lines. Moles tend to be significant around particular issues and thus tend to be related to short term issues, whereas the lines, indicate more longer term trends and dispositions. Let's have a look at some of the different areas on the palm where moles may arise and disappear. Area No. 1: is located just below the index finger indicates moodiness and frivolity in the person. Under the influence of this sector will endear the person to a period of foolishness, silliness, and undulating moods. At a physical level a mole in this area may suggest liver and digestion problems. A larger mole indicates hyperactivity. Area No. 2: under the middle finger indicates lack of care and dutifulness. Under the influence of a mole in this sector, a person will lapse in their decision making and potentially place themselves in danger of accident and injury. A mole in this sector also indicates a weak cardiovascular and nervous system. Area No. 3: under the ring finger indicates a disposition where a person may lack much sense of personal grooming, which may also lead to some connotations of lack of self esteem. In addition, such people lack much sense of responsibility. In physical terms a mole in this area may indicate a weak heart. Area No. 4: under the little finger indicates a spendthrift disposition. People with a mole in this location may tend to be very unsociable and suffer from a poor home life. In physical terms a mole in this area may indicate reproductive problems. Area No. 5: around the area of the wisdom and life line opposite the thumb indicates a very powerful and dominating ego. A person's thoughts, decisions, and actions are heavily influenced by their own vanity, need for power, or sense of superiority over others. In physical terms, the stress from this disposition may lead to a weak digestive system, heart, and liver. Area No. 6: under the left hand side of the mind line indicates a very weak will and stubbiness. Such a person will resist others and tend to go against or even antagonize others. These people have very little sense of fairness. In physical terms, a person under this disposition tends to have a weak cardiovascular system. Area No. 7: at the bottom right hand side of the palm indicates a drastic lack of energy and enthusiasm for anything. This person will also have many problems with relatives and friends. Under this disposition a person will work very hard to escape any family financial responsibilities. In physical terms, a person will tend to catch regular colds and flu. Area No. 8: at the bottom left hand side of the palm has different gender indications. For a male, a mole in this area indicates great anxiety and nervousness. Such a person will tend to overreact to others, and place great importance to small and minor issues. A female will tend to lack any care for others. She may adopt a masculine disposition. In physical tends such people may respiratory problems. Area No. 9: in the middle of the palm has a number of indications depending upon where the mole is specifically located. If the mole is located close to the life line, a person will have a lack of body power. This person will find it difficult to cope in any domestic situation. If the mole is close to the mind line, a person will tend to be very short tempered, or very sensitive and emotional. If a mole is close to the wisdom line, a person tends to be very naive. Moles on the palm of the hand show a strong connection between personality and health. In other words, there are grave personal consequences for having a short temper or being irresponsible, etc., in health terms. However generally speaking moles on the palm of the hand are very rare, but sometimes appear suddenly and disappear suddenly. If a mole appears, be careful, it indicates problems ahead. As we know in the quantum world: everything is connected to everything else.